How can I protect my wheat? Crop protection literally means what it says: the protection of the crop (wheat in this case) against weeds, insects and fungal diseases that compete with the plant and that can damage the plant. 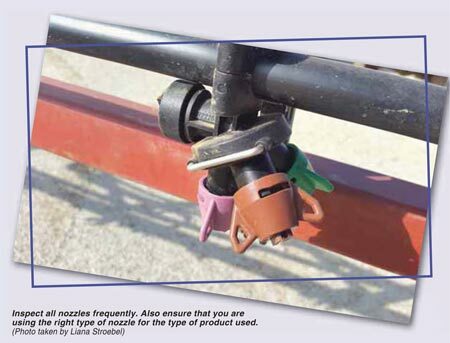 If planting occurred at the regular time – the end of April until mid-May – the first part of June will be an important time for the post-emergence control of weeds. 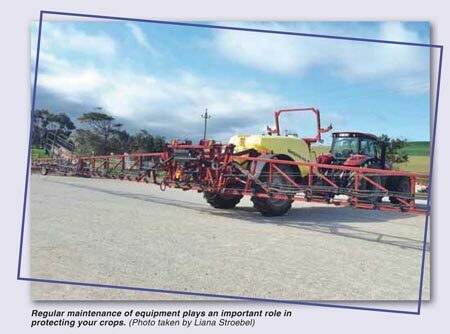 With planting pre-emergence herbicides are usually applied. Like the name says, the herbicides are applied before the weeds (and the wheat) emerge, and this means that the wheat can emerge without competition from weeds. The control obtained is not always 100%, and weeds may start growing at a later stage anyway. Land inspections by experts will help with the identification of weeds that are present and it can then be decided which herbicides will be effective for the situation. Then we make use of post-emergence herbicides that are sprayed over the wheat. This kills the weeds but does not damage the wheat. We also call these selective herbicides. If the weeds are left to grow undisturbed, they use the moisture and nutrients intended for the wheat plant, and this leads to lower crop yields. 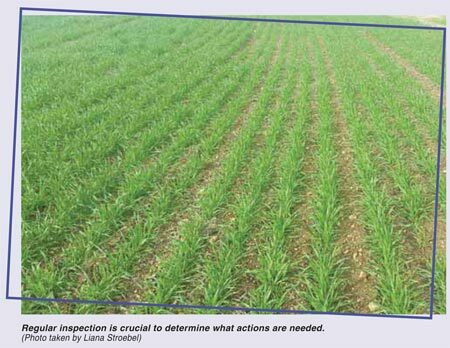 Post-emergence weed control applications are usually done approximately four to six weeks after the emergence of the wheat. Aphids, specifically the Russian wheat aphid, are also of interest now. The aphids can also be controlled by way of seed treatments: The seed is treated with an insecticide before planting and this ordinarily provides control for up to eight weeks. If the seed treatments were not applied, then it will probably be necessary to apply a pesticide in combination with the herbicide. Russian wheat aphids are easily recognised in the fields. The aphid feeds off the leaves and also secretes a toxin into the leaf, which causes the leaf to curl up and stand erect. Yellow, white or purple stripes will be visible on the leaf if it is uncurled. If this is not controlled, huge crop losses can occur. When field inspections are done to make decisions about weed control, attention must also be given to the possible presence of aphids. It is always wise to check the effectiveness of the post-emergence herbicides approximately three weeks after spraying. Possible corrective steps can be taken if needed, because weeds can become resistant to the herbicides and this can mean that the products that usually killed the weeds will not work anymore. Regular field inspections should still be conducted to see when fungal diseases start developing. The first fungicide application is made towards the end of June, between six and eight weeks post-emergence. We do this when the second nodes appear along the bottom of the stem. The first fungicide spraying is done with a strobulirine-type fungicide, which also increases the yield. It is always better to spray preventatively against fungi, in other words before the disease appears, otherwise the disease damages the leaf, which is the factory of the plant. This in turn may lead to yield losses. Field inspections continue to ensure that disease control is good, but three to four weeks later the fungicide is sprayed again. For some cultivars that may be very susceptible to fungal diseases, a third spraying may be necessary three to four weeks after the second spraying. While spraying for fungi, be on the lookout for the presence of aphids, and if necessary, add a pesticide again. The producer's footprints in the field remain the best fertiliser! Article submitted by Dirk van Eeden, Technical Marketing Services Manager: Crop Protection – South. For more information, send an email to DirkVE@InteliGro.co.za.